So she said to me that really, she didn’t need to be looking for any more business and that she ‘wouldn’t be taking on any more … for a couple of months at least,’ adding she “had been fortunate enough to pick up plenty of business to … last until Christmas.” We’re still in October. Impressed I was until I enquired how she was lucky enough to pick up such business. How can she possibly be seen as the professional ‘go to’ for her particular services if she is simply looking after her own schedules? What does this kind of disregard for others say about the way she feels about her future new business prospects? Respectful? No. Offer of support? Hardly? Reciprocal arrangement? No time for that… reliable? Sadly not. 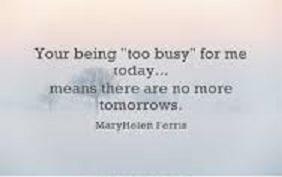 By simply suggesting that she is ‘too busy for more business’ the damage is done, the time spent cultivating the network to encourage the planning, future growth and attainment of future goals have been undone in one swift gesture of self fulfillment. We could argue that she is only being honest – and besides, she is not going to be letting anyone down by refusing the work. Is she? But what does the future hold? Again, we’ve seen this happen a lot although the situation still astonishes me and does nothing for the ‘biz neighbourhood’ do you not think?